Amazing Home Decorating - Handmade Fabric Mural. This is a great project to make yourself if you are on a home decorating budget. It takes up a good part of a wall, looks elegant and beautiful, and will cost you just a couple of dollars. You can make this mural to mount above a shelf, a mirrored vanity or just for any blank wall. If you have an empty wall in your house and want to fill it with something creative and unique, try this do-it-yourself project. To make this fabric mural you will need: six different colors of felt fabric. I used light pink, pink, white, brown, light green, and green. Decorating Tools: scissors, glue gun or masking tape. 1. Open the mural template and print it out in pieces. Tape the pieces together, so that you end up with life size mural printed on paper (see picture). You can also do this step a simpler way and draw your own flower shapes on a large size paper. The approximate size of this mural is 35" wide by 16" tall. 2. 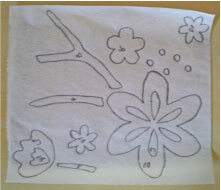 After putting together the paper mural, I took pieces of tracing paper and traced all the flower shapes (see picture). This will make cutting out the shapes very easy. Label the shapes with the colors that they represent. For example, I wrote G for green on the tracing paper flower (see picture). This way when you are ready to cut the shapes out of felt, you know which color of fabric to select. 3. Now take the tracing paper with traced flowers on it and select the felt color to match the flower you want to cut out. Put tracing paper directly onto the felt and cut out the shapes (see picture). This process will take a little bit of time, but after this it’s very easy. Once you have your shapes for one particular flower with inside petals cut out, take glue gun and glue the inside petals to the flower. You can also use craft glue or fabric glue for this. 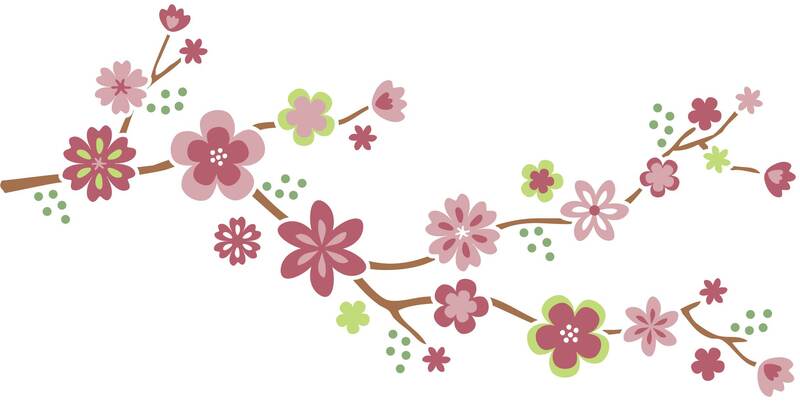 Cut out all the flowers and branches. 4. Once you have all the felt pieces cut out and the small flower petals glued to large flowers, lay out the whole mural on top of the printed template (see picture). This way you will make sure that all the little pieces are cut out and can start working on attaching the mural to the wall. 5. Pick a wall that you want the mural to be on. The wall has to have enough space to hold the 35" by 16" mural. If you want to attach the mural to the wall temporarily, use masking tape. If you want to attach the mural to the wall permanently, use glue gun. Pick up the felt piece by piece and glue it to the wall. Look at the printed out template once in a while to make sure that you are gluing pieces according to the printed layout. Now you have a handmade masterpiece to add to your decor. You can greatly simplify this project by just sketching large flowers on tracing paper and cutting out those shapes. Draw some freehand branches and cut those out too. 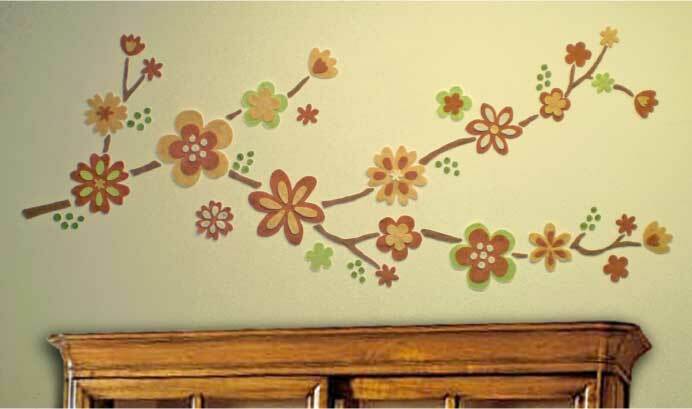 Glue all the pieces to the wall in your own arrangement for a one of a kind piece of mural. You don't have to have inside petals for the flowers. If you want to make things easy, just have one-shape flowers of different sizes. 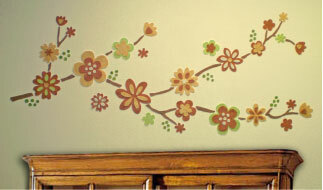 Decorate this mural further by adding fabric flowers, buttons and bows to the arrangement. Enter your e-mail to get our Special Offers! Copyright (c) 2007-2015 Amazing Home Decorating. All rights reserved.